I make dinner pretty much every night. We don’t eat out all that much because the baby likes to start falling apart at 6:15 or 6:30, which doesn’t leave a lot of time for relaxed dining. Um. . . that meal we just paid a pile of cash for? THAT was what was for dinner. But when Bart is out of town or has a late meeting and won’t be home for dinner? There is no dinner. Unless he’s gone for three or four nights in a row and I finally get tired of cereal for dinner, I rarely make dinner when he’s gone. 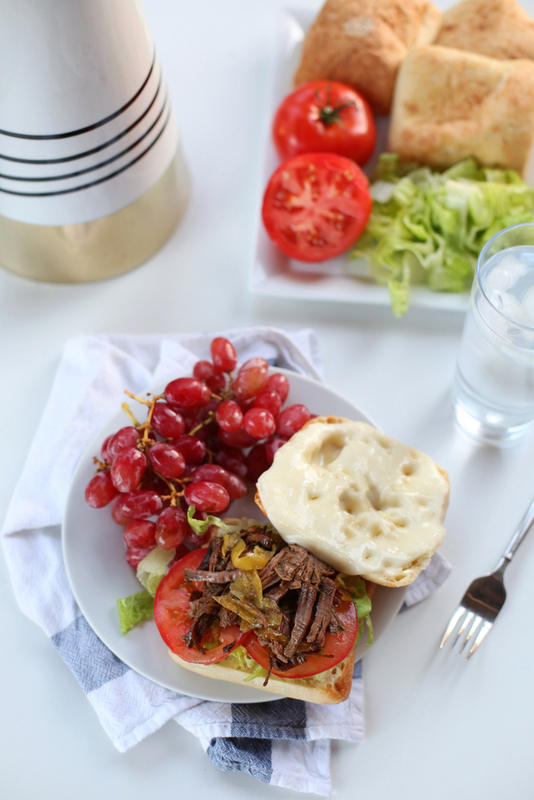 And so I tossed everything in the crockpot while the girls ate breakfast and when we got home from the pool at 5:30 that night (because, yes, it was 100 degrees earlier this week), this delicious dinner was ready 5 minutes later. For once, I didn’t have to be jealous of whatever Bart ate for dinner while he was gone. Especially because when he got home, he said his dinner was pretty mediocre anyway. Generously season your roast with salt and pepper. Place it in the bottom of the crockpot and pour the whole jar of pepperoncinis over it (juice and everything). Add the remaining spices, put the lid on the crock pot and cook on low for 8-10 hours or 4-6 hours on high. When you're ready to serve dinner, shred the meat with two forks and let it soak in the liquids while you prep everything else. Turn the broiler onto high. Slice the rolls in half and spread mayonnaise on both halves. Place a slice of provolone on the top half and place all the rolls on a baking sheet. Broil for 2-3 minutes, keeping a close eye on it, until the cheese is bubbling and the rolls are slightly toasted. 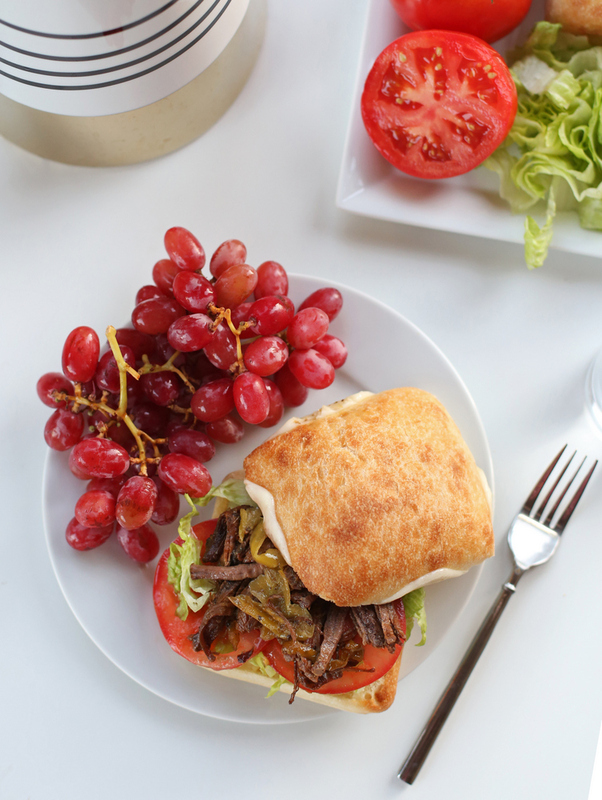 Place tomatoes and lettuce on the bottom bun, add the shredded beef, and top with the top bun with cheese on it. Enjoy! These sandwiches look amazing! 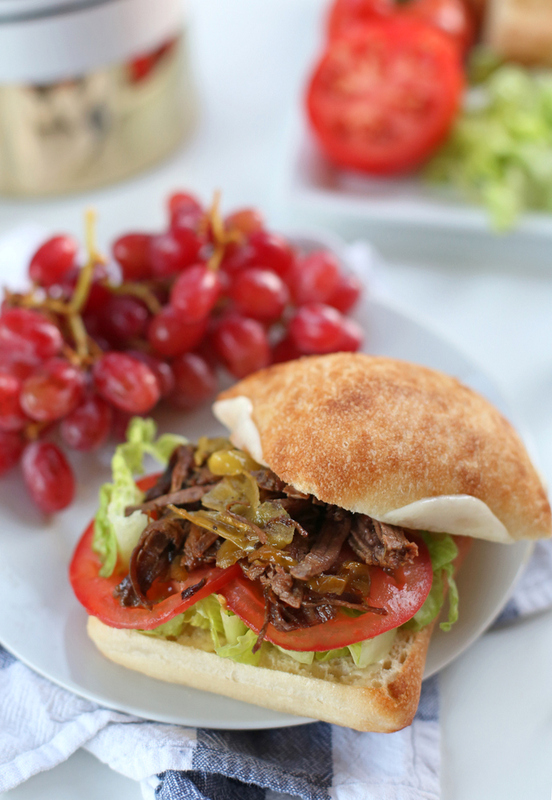 We love french dip sandwiches in our house so we'll have to give these a try asap! Um, yes. Yes, please. Right now. And thank you. Boom, you solved the 2-5pm church dinner crisis for this week. One of my favorite recipes is very similar to this! a roast in the crockpot, dump in sliced pepperoccinis, a packet of onion dip mix, salt, pepper, and cook all day…delicious! I'll have to give this one a try as well. that looks amazing! 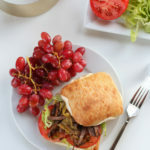 I have a 2 lb pork tenderloin in my fridge and I'm considering trying this recipe with it! Sorry for the stupid question, but what kind of beef roast do you use for this? I usually just buy whatever beef roast is on sale – so sometimes round, sometimes chuck, sometimes something else. I haven’t noticed a huge difference, frankly. Just tried this tonight and the entire family loved it! Really simple to throw together. We’ll be making again. Thanks for a great recipe. I’m so glad you guys liked it! Thanks for letting me know.